RTG are set to launch their brand new Witchs Brew Slot on the 5th of October 2016 and, to celebrate, High Noon Casino is giving all new players a $60 no deposit bonus. Witch's Brew slot is a brand new 5 reel video slot with some great features that we have come to expect from RTG. This new RTG slots game will be available at all RTG casinos and if you would like to test out their games for free, we recommend signing up for a real player account at High Noon Casino and taking advantage of their no deposit bonus offer. The Witch and Dragon Fang is the symbol that is going to get you the most action in this new RTG slots game. This is the wild symbol that appears on reels 2, 3, and 4. A re-spin feature is triggered when 3 of the same wild symbol appear in any position on reels 2, 3, and 4. These reels will then be held in place while the other reels re-spin up to 10 times. A free spins bonus round is also featured and players can get 10, 25, or a massive 125 free spins when 3, 4 or 5 scatter symbols appear. The Goblin Blood symbol is the scatter and when the free spins round is triggered, wilds will appear grouped on the reels and all prizes come with a 2x multiplier. There is plenty of action and winning combos to be had in this RTG casino title. 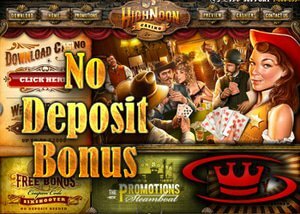 Right now all new sign ups at High Noon Casino can claim a $60 no deposit bonus. In order to get your hands on this free casino cash, you must register for a real account and enter the bonus code SIXSHOOTER in the cashier section. The minimum deposit amount of $35 is required to withdraw your winnings and this no deposit offer comes with a 50x wagering requirement. The maximum amount you can win is $300. That's not all, there are two first deposit bonuses that players can choose from. The first of these is a slots only bonus and it's worth 200% up to $2,000. The coupon code for this welcome offer is HIGHNOON200. The minimum deposit amount is $35 and the wagering requirements are set at 25x. The other choice is an any games bonus and this is a 100% up to $500 welcome offer. The minimum deposit is again $35 and the wagering requirements are set at 30x. The coupon code to be used is HIGHNOON100.